Shell Lake State Bank is committed to helping you and your business succeed with our business checking account options. Shell Lake State Bank offers a variety of Business Checking options. Please select from the options available below or contact us for more information. Organizations, governmental units: Please visit personal accounts for more information. Subject to a minimum average daily balance of $300.00. Accounts that do not maintain this minimum average balance will be subject to a service charge of $2.00 plus $.10 per check that cleared the account during the month. As of 7/21/2011, Banks were allowed to pay interest on Business Checking accounts. These accounts are designed for partnerships and corporations (including LLCs and LLPs) which previously were not allowed to have interest bearing checking accounts. Subject to a minimum average daily balance of $5,000.00. A monthly service charge of $5.00 and $.10 per check will be applied to the account if the minimum average daily balance falls below $5,000.00 for that month. Accounts with an average daily balance between $5,000.00 and $25,000.00 will receive a rate of interest which will vary periodically and is subject to change monthly. Accounts with an average daily balance of more than $25,000.00 will receive a higher rate. This rate is subject to change monthly. $2500.00 Minimum Average Daily Balance required. A monthly service charge of $12.50 will be imposed if the average daily balance falls below $2,500.00 during the statement cycle. Transfers or withdrawals are limited to a total of six (6) by means of, pre-authorized or automatic transfer or telephone, (including data transmission) agreement, or by check, draft, or similar order payable to third party per statement cycle. Check out the free SHAZAM BOLT$ mobile app to identify potential fraud, find surcharge-free ATM’s and monitor accounts. SHAZAM BOLT$ provides alerts for purchases exceeding your defined amounts, phone or Internet purchases and suspicious or high-risk transactions. You may already have a chip card, or you may be getting one in the future. The chip is located on the front of the card and the magnetic stripe remains on the back of the card. The chip on the card is to provide additional security. When using your card at a terminal that isn’t chip enabled, you will use your card as you have in the past. If you swipe your card and the terminal is chip-enabled, it will prompt you to insert the card. For terminals that ARE chip enabled, you will need to insert your card instead of swiping it and the card will need to remain in the terminal until the transaction has completed. Using your chip card at an ATM may differ based on the type of ATM. If your card isn’t visible when you put it in the ATM, a chip-enabled ATM will automatically recognize the chip on the card. 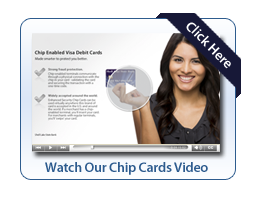 Please keep in mind that your chip card will be returned at the end of the transaction. If you wish to complete multiple items, you will need to put your card in separately for each item, ex.) balance inquiry, funds transfer, withdrawal. It is important to remember to take your card once the transaction is complete. If your card is visible when you put it in the ATM, insert and remove your card as you normally would. If the ATM is chip enabled, you will be prompted to insert the card again and leave it inserted until the transaction is completed. If you wish to complete multiple items, you will need to put your card in separately for each item, ex.) balance inquiry, funds transfer, withdrawal. It is important to remember to take your card once the transaction is complete.